Can Football Finally Tackle Its Injury Problem? After a half-dozen jarring collisions on the gridiron last weekend, the backlash against the backlash was predictable, if downright depressing. No sooner had the NFL announced this week that it would start handing out harsher fines (in the tens of thousands of dollars) and suspensions for players who tackle above the neck and lead with their helmets than a bevy of current and retired players bemoaned that their beloved game was being unreasonably watered down. Chicago Bears linebacker Brian Urlacher mockingly suggested they should start calling the league the NFFL  for National Flag Football League  and Pittsburgh Steelers linebacker James Harrison, who was fined $75,000 for leaving two Cleveland Browns receivers with concussions after helmet-to-helmet hits, went so far as to claim he was considering retirement because he couldn't possibly play under the new restrictions. But if the players' union reps are going to continue to gripe about how the league doesn't do enough to take care of the health of its retirees, then they are going to have to come to grips with the factors on the field that are leaving 40-something ex-linemen in such terrible physical shape. How many more horrors do football players have to suffer before both players and officials, from the NFL all the way down to the Pop Warner leagues, start considering more-drastic changes to the way the game is played? If the events of last weekend  which also included the paralysis of a college player who made a head-first hit  don't spark a serious reform debate, nothing will. And no idea, no matter how seemingly outlandish, should be dismissed out of hand. Back in January, in the course of reporting a TIME cover story on ways to make football safer, one idea I kept hearing, and that several readers subsequently championed, was to take a look at rugby. That sport, the arguments went, also requires violent tackling, and those guys play without helmets. Some experts in biomechanics feel that football helmets actually encourage concussions: when helmets clash, the head decelerates instantly, yet the brain lurches forward, resulting in a bruising and stretching of tissue. Take the helmets out of football, some people claim, and players would be less likely to use their head as a weapon. Concussive episodes, and the long-term damage we're learning they cause, would decline. That argument, however, doesn't actually square with reality. Rugby, as it turns out, has plenty of problems with head injuries. According to one study, in South Africa about 14% of high school rugby players and 23% of professional and club players annually are diagnosed with concussions. Further, Michael Keating, the medical director for USA Rugby, says that a review of the scientific literature indicates that the number of incidences of concussions among rugby players and American-football players are similar. Some data suggest rugby incidence is 5% higher. While concussions have become a major and growing problem in football, helmets have actually been pretty good at preventing much more dire skull fractures. "If there were no helmets and the game was played the way it is today, a lot of people would be dead on Day One," says Chris Nowinski, a former Harvard defensive tackle who is now the co-director of the Center for the Study of Traumatic Encephalopathy at the Boston University School of Medicine, a prominent brain-trauma-research organization. Still, football can learn some valuable lessons from rugby. In that sport, hits above the head, and even those using the shoulder, are illegal. You essentially must tackle with your arms, and players are drilled on a technique in which the defender moves his head to the side of an opponent's body to avoid head-on collisions. It's not such a stretch to think an NFL player could adjust to these kinds of rules and become a defensive stalwart by bear-hugging players to the ground rather than launching himself like a heat-seeking missile. It wouldn't make for such jarring highlights on SportsCenter each Sunday night, but it could save lives. 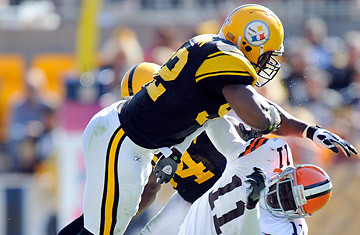 If playing without a helmet is indeed too risky, what about keeping the headgear but losing the face mask? Some observers contend that if a football player's face were unprotected, he would be less likely to use his head as a weapon. "The most realistic option is getting rid of the face mask, with players having eye protection, like goggles," says Nowinski. True, without the face mask, you might see more broken noses and face lacerations. But any player would take a broken nose over a broken brain. Further, such a change would eliminate that ghastly face-mask penalty, in which a defensive player clings onto an opponent's face mask and yanks his neck as if it were a rag doll's. One of the problems, of course, is that players often find the idea of these kinds of modifications laughable. Even some retired players who have struggled with concussions don't want to tinker with a game that has caused so much damage. "If you change the game from what it is now," says Harry Carson, a Hall of Fame linebacker from the New York Giants, who says he suffered 12 to 18 concussions during his career, "it's going to be a shell of what it has been." Yet it's possible to fix football without compromising the appeal of the game. Dr. Robert Cantu, a neurosurgeon and concussion expert, argues against losing helmets or dumping face masks. "I don't want to take a step back on equipment that is superior," he says. "And if we have a way to prevent broken noses and eyes, we should take it." However, Cantu, also a co-director of Boston University's brain-trauma center, advocates taking the head out of football. He recalls the 1950s, when players like Hardy Brown hit with their shoulders, not their head, causing ball carriers to go cartwheeling through the air. It was violent. It most certainly wasn't flag football. It was smarter football. NFL players are among the best athletes in the world. They make millions because they can control their bodies and have superior muscle memory. If they were truly taught to tackle like a rugby player  allowing shoulder strikes, say, but banning head tackles  they could adapt. And would the NFL lose a single fan? There'd still be those beautiful 60-yard pass plays. Running backs would leave defenders on the turf. There would still be plenty of violent tackles. Only those dangerous head-on collisions would be gone  and would anyone really miss them? See the Top 10 Super Bowl moments. See the "Legends of the NFL's 'Greatest Game Ever.'"